By working in groups, we use the practice of art making to inspire community building, foster team-work, and support peaceful practices of sharing and co-creation. Through the process of creative collaboration, we focus on improving the peaceful communication and interpersonal skills of our participants. This group work results in developing individual self-esteem, creating uplifting and meaningful art, and hopes to support the fostering of self-awareness in our participants. 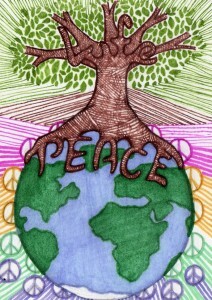 Promote Positive-Peace Practices. Utilizing visual art making as our focus, Create Peace Project invites participants to actively engage in the practice of peace; being quiet, calm, and centered by teaching breathing practices, leading meditation, while encouraging interactions of kindness, respect, and loving acceptance. Using creativity, we aim to reach, educate, and inspire people on a global scale to not only create art, but to use it to spread the positive and promote peace. In this way, we invite participants to open their hearts, share their voice, and spread hope through our art-for-peace projects. Our Philosophy: Create Peace Project is founded on the philosophy that the practice of creative self-expression is one of the greatest tools for fostering self-awareness. By making art, one shifts their attention from an outward orientation, to an inward one. Taking the time to explore one’s feelings, thoughts and emotions through self-expression supports the participant in being present with what is happening for them. Being present is the act of being at peace. And so, before art making we breathe together, we sit together, and we share a moment of silence in order to reinforce this practice. When one is at peace with themselves, they can be at peace with others, and thus at peace with the world around us. From there we can share those positive feelings with our art and create a splash of peace. We believe that the practice of peace starts with the individual and from there ripples out into the world. We support creativity and creative self-expression as the premiere vehicle with which to peacefully engage youth and thus learn how to resolve our differences non-violently. 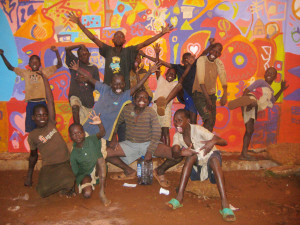 It is our intention to couple this philosophy by encouraging visual art making and the raising of self-awareness through both individual and collaborative arts projects around the topic of peace We must begin to empower and encourage today’s youth to live, practice, and exemplify a peaceful way of life now. We work with people of all ages, with an emphasis on youth ages 8 – 18. In this fast-paced age of over-stimulation, heightened violence, under-nourishment and socio-economic stress it isimperative that we further the exploration and cultivation of peace as a daily personal and communal practice. In this way, we are generating the awareness and commitment to creating the world we all seek to live in: a world overflowing with love, joy, and beauty expressed by our acceptance and compassionate understanding of others. Let’s Create Peace.